Late summer and early spring are common times to see these pests in and around your house or office. What attracts Box Elder Bugs is their search for warmth to survive the winter months. During spring and early summer, these bugs are content living on female box elder trees and mating, which is why you do not often see infestations of them in these months. A sigh of relief is that they cannot harm you, and they do not carry diseases. The worst they can do to your property is stain surfaces with their excrement. 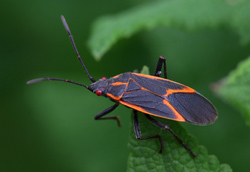 Box Elder Bugs are also generally harmless to houseplants which is more good news. To guarantee absolute elimination of all Box Elder Bugs your best bet is hiring a Minnesota pest exterminator. What you may not realize is that the ones you see are not close to the number you may have. That is why it is important to hire a professional pest control company.